the more i learn about weaving, the more fascinating i find it. 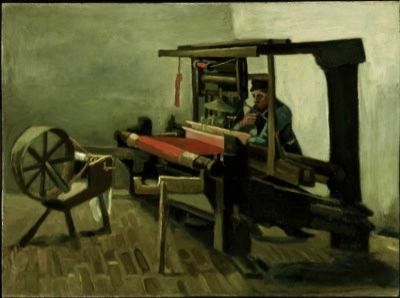 for example, van gogh's entire weaver series (and it seems there are many paintings done in 1883-84) features men at the loom. 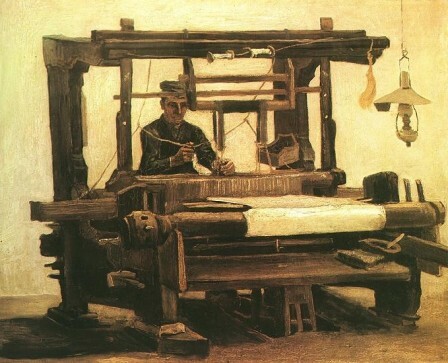 that means that as recently as the 1880s weaving was a man's work, tho' i think that today it's perceived as a woman's pastime. and i use pastime on purpose, as in the industrial age, it's something people do for fun, not by necessity. if you think about it, that's a fairly fast transition, which was, of course, aided by mechanization - but it represents a radical shift in gender, from male to female work. and, although i've only begun a bit of preliminary research, it seems there has been a corresponding downgrading of the profession. i can't at the moment think of another profession that has undergone a similar change of gender. 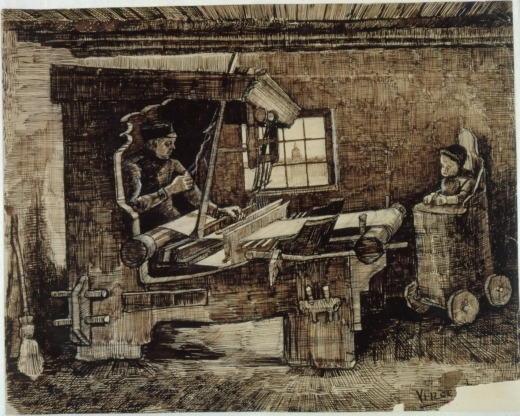 this one may be the most surprising one of all - as there's a child in a high chair with the weaver! 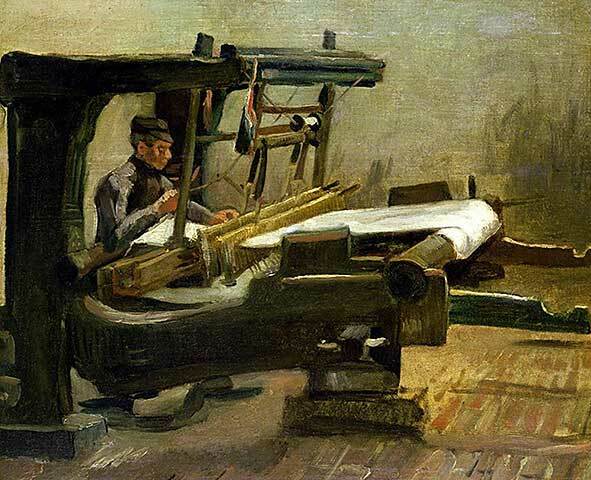 i didn't even go into how beautiful van gogh's looms are and i wonder when the design of those changed as well and if it's somehow connected to the change in gender. 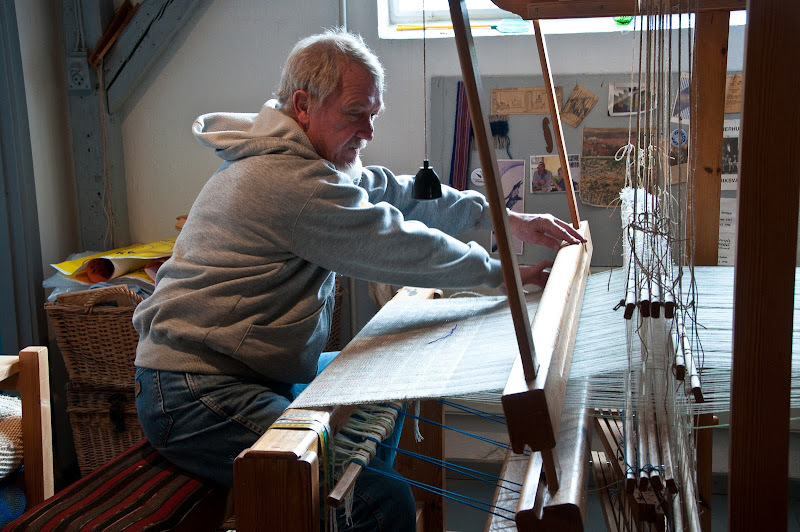 it seems there is plenty more to learn and research about weaving. the big red button in the middle of me is a "gender discrepancy" button, so I tend to notice these things.... thanks for noticing too! You are gonna be such a happy person when you loom is standing in its new place and ready to be used. Although I don't understand why you want to be able to paint? I would love to learn how to do this. Fascinating! I love this post!!! Thank you for writing and posting in the middle of your packing and moving. Appreciate that! Very interesting post! Great van Gogh portraits! 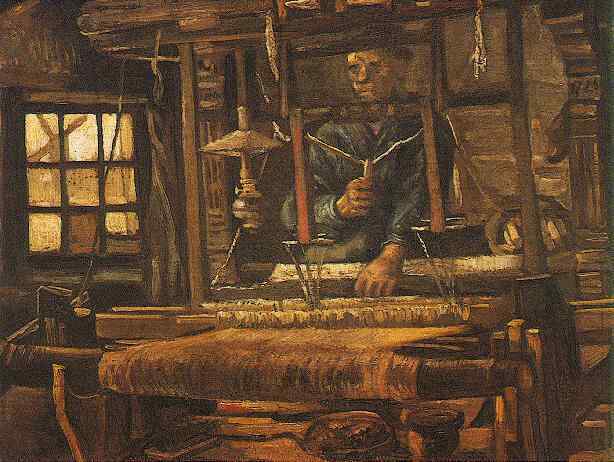 I had no idea VanGogh had done a weavers series. Great stuff! that's a series i've seen before but had forgotten...thank you for reminding me. i'm so loving your classes. it reminds me how much i miss taking some sort of class. It only looks at these changes since the 1970s, but very interesting anyhow. ack! a random post without pictures! "like a fish in water"